The original Pebble smartwatch (aka the Pebble Classic) was a big hit in a small market, but now the space is far more crowded, with the Apple Watch and various Android Wear devices vying for attention. That makes Pebble's job a whole lot harder, but the company seems ready for a fight, having just announced three new wearables- the Pebble 2, the Pebble Time 2 and the Pebble Core. It's arguably the Pebble 2 that's got the most to live up to, as while it's not the top of the range it is following in the footsteps of the company's first hit. So what's changed? And is there enough new for Pebble to have another success on its hands? The Pebble 2 has a 1.26-inch 144 x 168 black and white E-paper display, which is exactly the same resolution and almost exactly the same size as the Pebble Classic's 1.25-inch screen. There's no fancy color here, you'll need to invest in the pricier Pebble Time or Pebble Time 2 for that, but both the Pebble and Pebble 2 have an always-on display and it's readable in sunlight. On paper there should be little to choose in terms of battery, with both watches claiming up to seven days of life. It's too early to say whether the Pebble 2 will live up to that claim, but the Pebble Classic does, so we don't have any reason to doubt it. That long life is one of the big selling points both these watches have over most rivals. The Pebble 2 sports a polycarbonate body and silicone strap, just like the original Pebble, so if you want a premium metal watch you'll need to check out the Pebble Steel, Pebble Time Steel or something over in Android or Apple land. But while the Pebble 2 definitely puts substance over style it has improved on the look of the Pebble Classic in some ways, as it's smaller, thinner and lighter at 39.5 x 30.2 x 9.8mm and 31.7g, to the Pebble's 52 x 36 x 11.5mm and 38g. 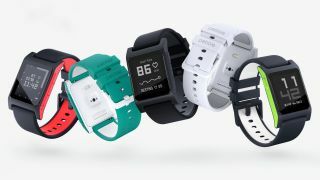 The Pebble 2 also comes in a wider range of colors. There's a choice of black, white, aqua, flame and lime, while the original Pebble comes in just red or black. With no touchscreen on either watch you're stuck with physical buttons here and the layout is the same on both, with three buttons on the right and a fourth on the left. An ARM Cortex M4 processor ticks away at the heart of the Pebble 2, which is an upgrade on the ARM Cortex M3 in the Pebble Classic. Actual features aren't much changed. Both watches are water resistant, though surprisingly the Pebble Classic is to 50 meters, while the Pebble 2 is just to 30 meters. You also get activity tracking skills in both, but the Pebble 2 adds a heart rate monitor into the mix, so its health monitoring abilities are slightly stronger. It also has a microphone, which the original Pebble doesn't, so you can record voice notes. There's no Wi-Fi or GPS in either though, so they're both very reliant on your phone. The Pebble 2 is live on Kickstarter, so you can back it now but you'll have to wait until at least September to get it on your wrist. There is an advantage to putting your money down ahead of launch though, as you'll get it cheaper that way, with Kickstarter backers paying US$99 (around £70/AU$140), while those who buy it after launch will be looking at a US$129 (roughly £90/AU$180) outlay. Of course if you don't fancy waiting you can pick up the original Pebble right now, though it's no cheaper than the Pebble 2's Kickstarter price, at US$99.99/£79.99 (around AU$140). The screen and battery life are almost identical on both watches, but Pebble has managed to fit them into a far more compact design for the Pebble 2. With a microphone and heart rate monitor added into the mix too, along with a faster processor and a similarly low price, at least for Kickstarter backers, the Pebble 2 could make for a tempting upgrade, but if you want the best that Pebble has to offer you should check out the Pebble Time 2. The Pebble Time Round shows there's more to life than squares.